While there are probably adults who shouldn’t be caving, and there are some children who are exceptional cavers, this weeks question wonders what the average age young people should reach before being taken caving. Although it likely has much to do with liability reasons, many commercial caves and U.S National Parks restrict their “wild cave tours” to those 16+. At the same time, there are organizations like You Opportunities Underground that specifically target taking young people underground, for its educational benefits. What age is old enough to go caving? Last weeks poll found that most folks believe that the actors are not at fault for their part in the bat deaths in Bulgaria’s Devetashka cave. Poll: Were you Alarmed by the New WNS Death Toll Estimate? There is a whole lot more to this than age alone. How many adults are going to be there? What is the condition of the cave? How well does the kid follow instructions and how comfortable are they with the other adults? 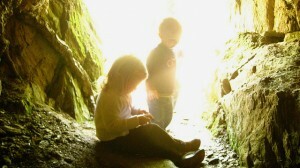 My grandson started caving when he was 7 because the conditions where right at the time. The cave, the other people going, and his own attitude made it a fun trip. My husband and I took our son into his first cave at age 7 weeks (in a sling, down a manhole and through a culvert). He subsequently did several more caves in a sling before he turned one (I was the trip leader for ones of those trips). He is now almost three and has done a dozen wild caves, two of which required on a harness to navigate some 10-15 foot drops.